Average Weight	: 25 - 38 lbs. I’m an individual interested in finding corgis forever homes. 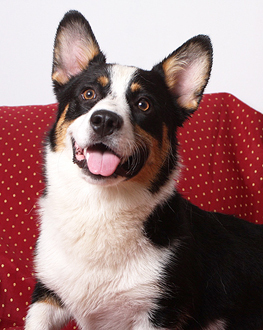 The Cardigan Welsh Corgi is older than the Pembroke Welsh Corgi, with the Pembroke being bred out of the Cardigan. Both Corgi varieties may be a descendant of the Keeshond, Pomeranian, Schipperkes and the Swedish Vallhund. Cardigan Welsh Corgis are one of the oldest breeds in the United Kingdom, with early examples of the breed reported in Wales some three thousand years ago. The Cardi was originally used simply to protect herds of cattle en route from Wales to English markets, but in time the early Welsh drovers realized the utility of the Cardi as a herder and began using the breed in this capacity. A later cross with traditional Welsh sheepdogs increased the Cardi's herding capabilities still further, resulting in the Cardigan Welsh Cardi as we know it today. Some say the older Cardigan was from Cardiganshire, brought there by the Celts in 1200 BC, whereas the Pembroke's ancestors were introduced by Flemish weavers to the Celts in the 1100s. Whatever the case may be, the Cardigan and the Pembroke Welsh Corgis were interbred and considered the same breed up until 1934 when a show judge thought they were too different and separated them into two different breeds. After they were separated the Pembroke gained in popularity and is to this day more popular than the Cardigan. The name "Corgi" is specific to that type of dog breed in Cymreig (Welsh). Dog in Cymreig (Welsh) is 'Ci' or if it is softly mutated 'Gi,' hence Corgi. The Pembroke was actually recognized by the AKC a year before the Cardigan. The Cardigan was recognized in 1935 and the Pembroke in 1934. Corgis were used as cattle drivers, vermin hunters and farm guards. They drove cattle by barking and nipping at the cattle's heels rather than just herding them. The dog's low stature helped him roll out of the way of kicking cows. •	Cardigans are known to be vocal and will bark at everything. •	Cardigans are easy to train and eager to learn. •	Corgis can be ‘nippy’ towards strangers who approach them too quickly. One serious problem with the breed's temperament is, to paraphrase Sartre, the problem of Other Dogs--the Cardi's wariness and aggressiveness when faced with other dogs. This is a natural side effect of the dog's history--herding dogs were frequently responsible for driving off any predatory dogs and wolves who threatened the flock--but that doesn't make it any less irritating or dangerous for you as a Cardi owner. You'll want to carefully supervise your dog in order to prevent any fights with other dogs which could result in injury either to the other dog or to your own. Other animals and children are less of a problem--the Cardi tends to perceive them as members of the flock, rather than as predators--and Cardis will generally protect and socialize well with them. Cardis are an extremely healthy breed compared to other dogs of comparable size and grouping. hip dysplasia is potential problem, as are mild eye problems ( Glaucoma and Progressive Retinal Atrophy in particular) in later years. The most dangerous ailment a Cardi faces, however, is degenerative myelopathy (DM), a spinal complaint most commonly found in German Shepherds. Although DM is a moderately rare condition, it's still a good idea to start having your Corgi checked by a vet starting at around five years of age. Cardigan Welsh Corgis do not require much grooming, as a rule. Two sessions of brushing a week should suffice to remove unwanted dead hair, which will not only keep your dog clean, but will minimize shedding (which happens seasonally, but moderately.) During the shedding season, it's often a good idea to start brushing the Cardi on a daily basis rather than a bi-weekly, but if you don't mind cleaning up the extra hair there's no major health reason to brush your Cardi that frequently. The Cardigan Welsh Corgi was essentially bred for exercise--the daily exercise of herding cattle along the long roads from Wales to England--and the breed's high energy level remains to this day. Because of this native energy, one could argue that you don't need to do a great deal to exercise your Cardi. They're very good at amusing themselves indoors, require only one or two walks a day, and don't tend to "act out" in destructive ways when they don't get outside often enough. It seems, on the surface, like this is the perfect low-maintenance breed. But the truth is that the Cardi requires a higher level of dedication than this. For one, the Cardi's metabolism can't quite match its energy level when the Cardi is kept indoors most of the time--which is why Cardis have a tendency toward obesity and overeating. You'll need to exercise your Cardi in order to minimize these problems and keep your Cardi not only trim, but healthy. Some extra walking will do the trick for this if you're in an urban area, coupled with some off-leash time at a nearby park--if your Cardi is generally well-trained and obedient, you can trust him or her off-leash for surprisingly long periods of time without any unwanted chasing or fighting behavior. (After all, Cardis were bred to stay with herds for long cattle drives--they would hardly be useful for this purpose if they instinctively darted at every rat or squirrel they saw along the road from Wales.) If you're in a rural area, take every opportunity you can to give your Cardi some off-leash time and some exercise in his larger environment. The exception to this rule comes when you're in an area with other dogs--the Cardi's aggressiveness toward strange dogs precludes off-leash exercise in these situations, unless you enjoy dragging a snarling, growling dog back from the brink of a fight. The Cardi's active and furious intelligence also requires you to give the Cardi more exercise and stimulation that you might think strictly necessary. The Cardis are extremely smart, problem-solving dogs, and if left alone their exercise might turn toward directions and goals that you, as a homeowner, don't particularly like: figuring out how to get those treats out of the doggie jar on the kitchen counter, for example, or other unintentionally destructive acts. By focusing on active, energetic training--tricks, ball-chasing, and other stimulating yet tiring activities in particular--you can keep your Cardi fit while at the same time keep his or her intelligence too occupied to focus on the problems that you don't particularly want him or her to solve. Cardis are highly intelligent, highly athletic, and highly trainable--providing that the trainer knows what he or she is doing. In fact, Cardis are so trainable--and so instinctively good at their basic, instinctual drives toward herding behavior--that it's a good idea to continue training them and offering intellectual challenges long after basic obedience is achieved. This isn't just fun for you and your dog, but it's also practical: the Cardi's basic herding behavior involves biting, nipping, and occasional barking, and if you don't provide the Cardi with intellectual challenges to distract from those basic drives, the Cardi will probably fall back on them simply to keep his or her active brain busy. So keep your Cardi well-trained and be willing to constantly introduce new challenges into his or her environment in order to spare yourself some occasional grief at your Cardi's sometimes overabundant energy. Because of their basic herding instincts, Cardis are exceptionally good with children and can often act as caretakers and protectors for extremely young family members. However, Cardis are not quite so good with other household animals, and they should be introduced to their prospective housemates at an early age in order to ensure adequate socialization and a minimum of dominance struggling or unwanted "herding" behavior. This holds especially true with other dogs--socialization with other household dogs should be done very, very early, and it's probably a good idea to tell your dog-owning friends to leave their canine pals at home when they come for a visit, no matter how well-trained your Cardi might be.